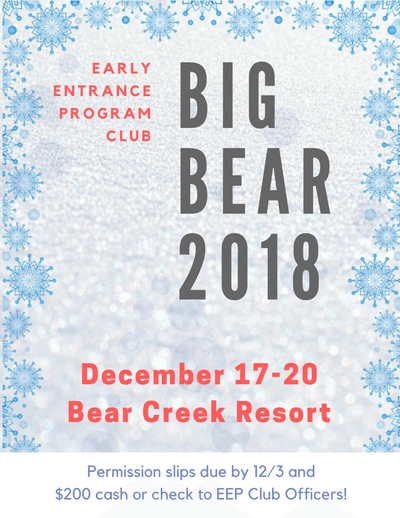 Join us for our annual winter overnight trip to Big Bear Lake! This trip is your chance to hang out with your friends and go skiing, tubing, or exploring around Big Bear Village. We will be staying in cabins at Bear Creek Resort. Big Bear is full of shops, restaurants, and fun daily activities! You and your friends can spend the day exploring town and experiencing all the wonder Big Bear Lake Village has to offer. The village also houses a movie theater - typically, many EEPsters go and see a movie on the last night of the trip. This well-attended social activity is sure to be a blast! Every year, a group of EEPsters take a trip to the Alpine Slide at Magic Mountain for a fun day of inner tubing. Participants will rent inner tubes and take turns sliding down the mountain! Big Bear is home to the Snow Summit ski resort, where EEPsters can spend the day skiing or snowboarding to their hearts' content. Skis, boards, safety gear, and other rentals can be obtained either at the resort or at one of the many rental shops around Big Bear Lake Village. Snow Summit, in addition to offering skiing and boarding lessons, offers a wide variety of slopes with varying difficulty. Any skier or snowboarder is sure to find slopes to suit their skill level!